For sale soon. Announcing here first before hitting Ebay. I'll soon be selling the following items. Three peripherals are *very* rare. The other stuff is commonplace. 1. 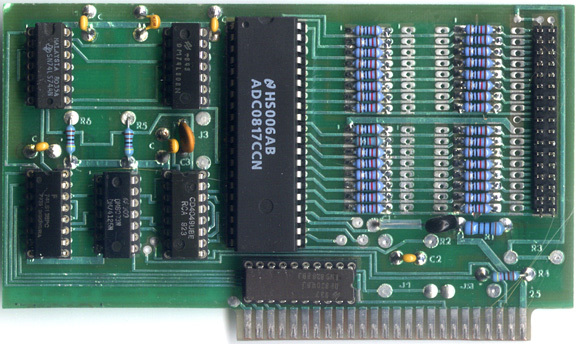 16 channel Analog to Digital board. 8 bit output. 2. 2 channel Digital to Analog board. 12 bit output. 3. Hollister Microsystems Eprom burner reader for 2716,32,64 and 128s. Includes high quality eprom erasing lamp. All items work great and software is included. The remaining items are a //e missing some keytops, a platinum //e in nice condition and your usual assortment of serial, parallel, disk interfaces, etc. I'm also selling a Gibson light pen which is rarer than some since it's not one of the later ones encapsulated in resin. A sider hard drive is also available, but is broken and missing the I/O card and cable. Anyway, I'm listing them here first so any serious offers might be agreed to. In my experience, usually no offers are made at all or they're very low, but perhaps someone might get lucky without having to deal with Ebay. Re: For sale soon. Announcing here first before hitting Ebay. Im interested in your Eprom card. Can you PM me your asking price?